Within urban transformation plenty of industrial areas and ordinary buildings fall lastingly vacant. What is widely considered as a problem for urban development can become a valuable resource for the city if vacant sites can be used to implement new ideas in terms of second hand spaces (Ziehl, M. / Oßwald, S. / Hasemann, O. / Schnier, D. (eds.) (2012): second hand spaces—Recycling Sites Undergoing Urban Transformation. Berlin: JOVIS). At vacant sites, second hand spaces draw on the atmosphere, the traces, the remains, and the history of their previous uses. Their users develop an individual aesthetic out of such sites, which stand out due to their simplicity and improvised quality. New ideas are tested and moments of surprise are created in the city. Second hand spaces are the result of a more or less self-determined adaptation of buildings and brownfields to the changed needs of their users. They evolve against a background of different demands on urban spaces and provide opportunities for interaction, participation, and start-ups at reasonable rents.The mostly financially weak users of second hand spaces recycle the material and immaterial values of vacant sites for economic, ecological, social, and cultural reasons, redefine them, and create something new out of them. The concept of second hand spaces was developed out of the experiences from the ZwischenZeitZentrale Bremen (ZZZ). The concept behind the ZZZ is to make space available to people and their ideas that would otherwise be inaccessible due to rents that are too high. The pertinent contract terms are carved out individually, but they basically adhere to the principle of a relatively favourable rent for a fixed-term use. In return, the users are prepared to adapt their demands and concepts to the piece of property and to invest a great deal of voluntary work in upgrading it as the ZZZ has no budget for reconstruction works to offer. The ZZZ is funded by the municipality of Bremen which is seeking to test new approaches in dealing with the challenges of structural change and new forms of work: For on the one hand, as a seat of industry the Hanseatic city wants to revitalize vacant buildings and brownfields, and, on the other hand, as a university city it tries to keep young graduates in town. Due to the transformations currently taking place in our industrial and knowledge-based society, the demands urban dwellers make on their urban spaces are changing. It is necessary to design the required adjustment processes to be as sustainable as possible, also in view of climate change and diminishing resources, whereby ecological, economic, and social aspects have to bear a balanced relation to one another. Second hand spaces provide urban planning with suitable solutions for their users practice results in buildings and brownfields being reused, revalorized, and reintegrated while conserving resources. At the same time, in many places second hand spaces already make a valuable contribution to the sustainable design of urban transformation. Michael Ziehl (*1980) and Sarah Oßwald (*1978) are co-operators of the temporary use office ZwischenZeitZentrale Bremen. 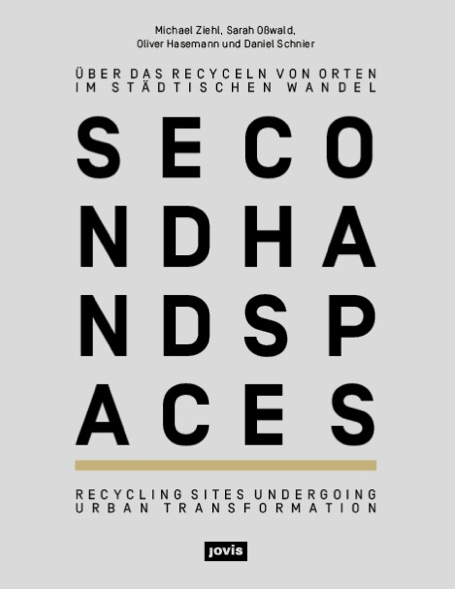 They published the book “second hand spaces–Recycling Sites Undergoing Urban Transformation“ together with their colleagues from the ZZZ Oliver Hasemann and Daniel Schnier in 2012. Michael Ziehl is a graduate engineer in the field of Architecture and of Urban Planning and lives in Hamburg. Sarah Oßwald has a degree in Urban Geography and lives in Berlin. Both have been pursuing the issues of reusing vacant spaces and initiate user-driven urban development processes in theory and practice. Michael Ziehl is chairman of the supervisory board of the “Gängeviertel cooperative” and co-initiator of the vacancy detector “Leerstandsmelder.de”. Sarah Oßwald was the initiator and co-operator of the temporary campsite Tentstation in Berlin and is responsible for Leerstandsmelder.de in Berlin.